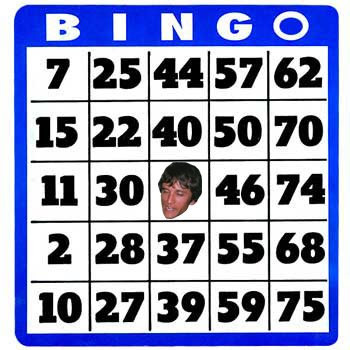 B-I-N-G-O, B-I-N-G-O, B-I-N-G-O, and Bingo was his name-o! 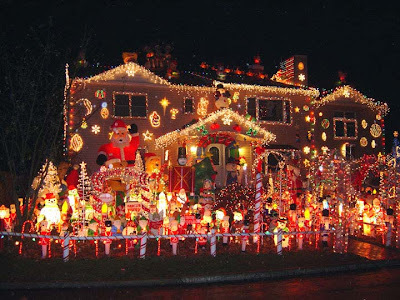 If you can't feel the Christmas spirit now, I don't know what's wrong with you. A while ago I told you about the Cat House behind our building. The story goes like this: our landlord, Francie, decided to donate her dead pet's house to the commons area behind our building. I asked her why there was a cat house back there and she explained to me that it is a place for animals to stay in for the night as they are passing through. A sort of critter motel, if you will. I had never heard of such a thing, but I didn't question her. You just don't question Francie, or you will be stuck talking for another ten minutes. After all this time, I've never seen any animals stay in the Critter Motel. Is it possible the wild animals don't realize Francie built the Critter Motel for them? Yesterday I noticed Francie shoveling a path to the dumpsters in our parking lot. "How kind of her," I thought. "A little unnecessary, but very thoughtful." Later I noticed that she also shoveled a pathway to the Critter Motel and cleared an opening by the front door. At least now the wild animals would know it's open for business should they need a place to stay for the night. Last night I saw a very nice family of raccoons rummaging for food around the dumpsters. So I opened the window and let them know there was a vacancy in the Critter Motel. 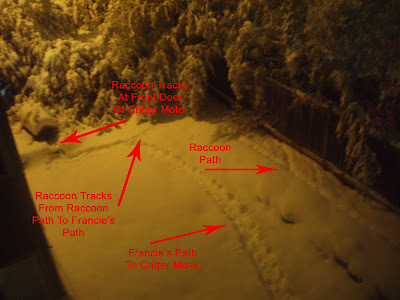 All along I've been skeptical of Francie's Critter Motel but the crazy thing is, I think the raccoons actually stopped by the Critter Motel last night. Francie, you were right all along. I'll never doubt the Critter Motel again. My Buddy + skiing = scared. Skiing + Denny Way = fun. Walking + Denny Way = not fun. My Buddy + snow angels = fun. My Buddy + snow = cold. I hear you are in a lot of hot water. 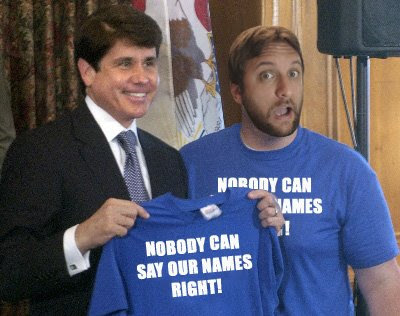 The news says you will probably be ousted as governor, you might go to jail, and your wife has a potty mouth. Good luck with all that. But I want to thank you. Thank you for showing us that someone with a last name that no one can pronounce and ends in "ICH" can make it in this world. To show you how I reached the end of my career, here's some of my work history over the years. learned that giving correct change is important." So true, so true. Next was Best Buy, 1995-1996. My friend Ben and I worked here during my Senior year. Basically we were in charge of the music, movies, and video game section and the managers loved us. To put things in perspective, back then you could still buy cassette tapes, DVDs didn't exist, and the first Playstation wasn't out yet (but we had a sweet demo kiosk of the Super Nintendo.) This job was okay, but all my paychecks went to buying stuff with my employee discount. Ben and I worked in the warehouse a lot, especially when getting ready for New Release Tuesdays. We heard stories and learned words we never knew existed from those warehouse guys. One of my favorite Best Buy stories happened one night when Ben was in the warehouse waiting for me to return from stocking the shelves with CDs. He got up on a big shelf above the swinging warehouse entrance doors. He was going to drop an opened refrigerator box on me as I walked in to trap me inside, but the manager Steve walked in instead. He looked up and caught Ben red-handed. On a side note, apparently one of our co-workers is still there. Ben noticed him there over Thanksgiving. Best Buy #297 in Reston, VA, 12 years after I worked there. 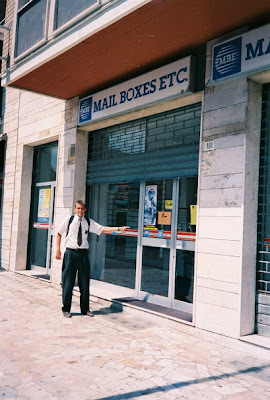 Mail Boxes Etc. was my next job, 1996-1997. I really hated this place. I dreaded going to work every day. Basically we weren't very busy and I only made $6-something an hour. And I wasn't even allowed to do crossword puzzles to pass the time. What a joke. Plus I had to wear a goofy uniform and stand on my feet the whole time. The assistant manager was this 50-year-old chain smoking hick named Rose. Her boyfriend didn't pay her enough attention so she started sending herself flowers and stuff from a "secret admirer" to make him jealous. So one day I sent a fax from the office computer with a love note from her "secret admirer." She flipped out and thought someone was stalking her. Sucker. were allowed to do crossword puzzles when things were slow there. 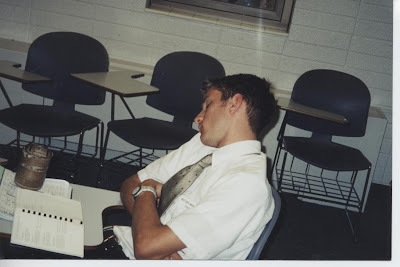 Then after my mission to Italy I had a couple of jobs in college. 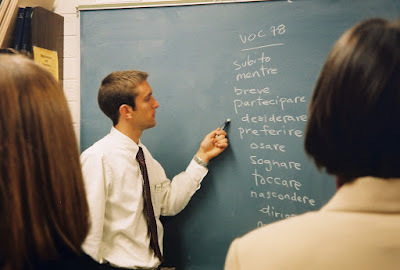 My favorite was teaching Italian at the Missionary Training Center in Provo, 2000-2002. 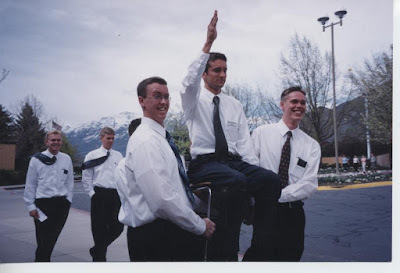 One of my favorite stories at the MTC happened when we would take walks around the campus during a break from class. We would usually pass 10 or 20 other classes doing the same thing, all learning different languages. The MTC is big on practicing your language wherever you go, so I'd have the class say, "Ciao brutti" and wave to the other classes as we walked by. We were saying, "Hello, uglies" but of course they thought we were just being friendly. They would smile and wave back every time. The other great part was eating in the cafeteria after class. $3 for all you can eat. What a deal. I guess I was really tired this day. missionaries will do anything you tell them. 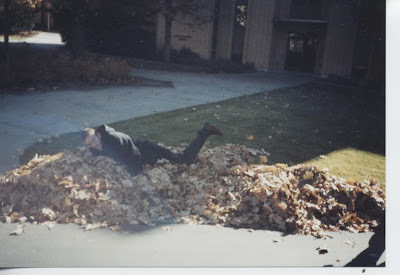 I don't know why I jumped in these leaves during a walk but the class loved it. amazing teacher. But do I have a big head? 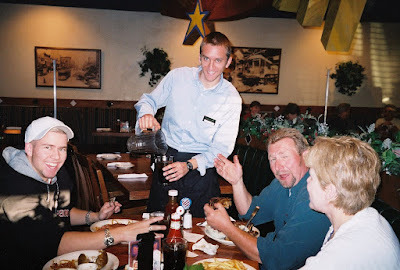 My other college job was serving at Tony Roma's Restaurant, 2000-2003. In case you don't know, it's a place for ribs. 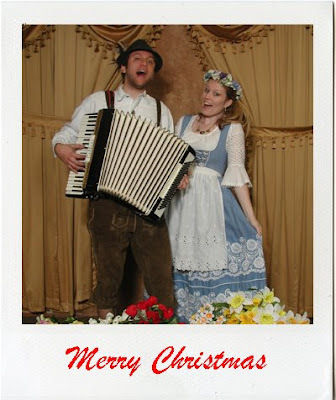 This was an okay job--I made good money and it was pretty fun, except for the times you got cussed out by drunk people (in Provo???) because you wouldn't bring them any more beer or when you got a table of "tithing tippers" (people who left only 10%). One of my favorites stories centered around an appetizer called "Potato Skins." As you can guess from its name, these were baked potatoes, scooped-out so all that remained were the skins, which were then stuffed with cheese, bacon, and chives. Well, one night this lady wanted some Potato Skins, only without the skins. I explained to her that without the skins, there would only be cheese, bacon, and chives but she just didn't understand. She must have gone to UVSC or the U. Some of our more famous patrons while I was there: Utah Governor Mike Leavitt, Elder Jeffrey R. Holland, Elder David A. Bednar, and a number of BYU football players. of the first rules of serving: Always pour drinks over the floor, never over the table. Bring on the golden parachute! 1. 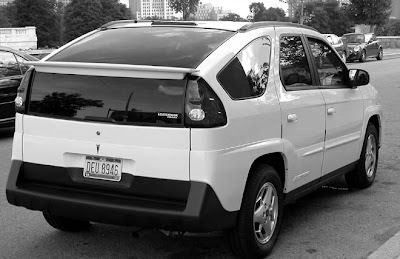 Pontiac Aztek: The ugliest car in the history of cars. Whenever I see someone who owns this car, I stop them and ask why they decided to purchase it. The most common answer: the dealer paid me to take it off the lot. 2. 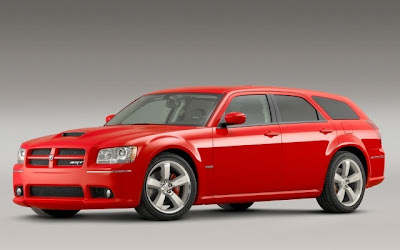 Dodge Magnum: If I wanted a station wagon I would have bought one in the '80s. 3. 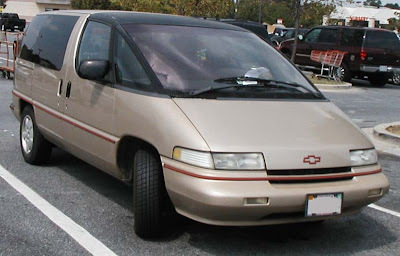 Chevy Lumina: I remember hating this car when it came out in the '90s. Come to think of it, I still do. 4. 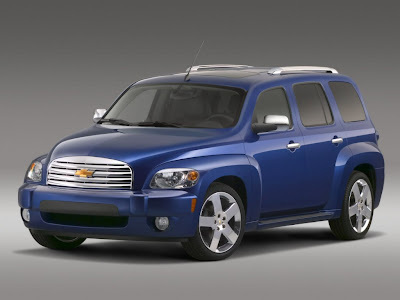 Chevy HHR: Looks like a cheap knockoff of the PT Cruiser. But why would you want to copy a car like that? 5. 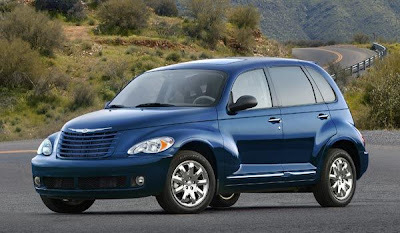 Chrysler PT Cruiser: See what I mean? 6. 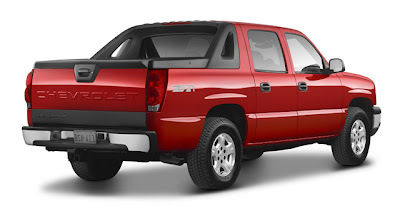 Chevy Avalanche: Buy a car or buy a truck, but not this ugly piece of junk. 6. 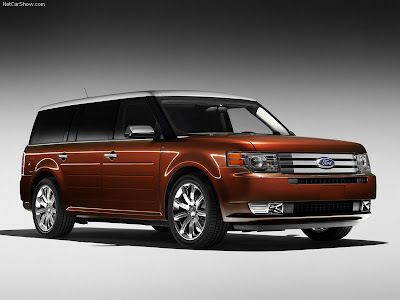 Ford Flex: Looks like a larger version of the Scion Xb. And that's not a good thing. 8. 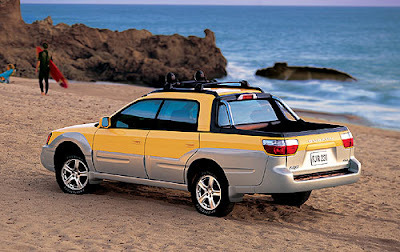 Subaru Baja: This is a Subaru but what if the Big Three try to copy it? Is it any surprise that Ford, Chevy, and Chrysler are going under? 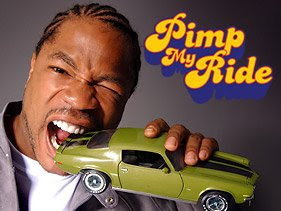 Even Xzibit couldn't pimp these rides so I don't know why you think your billions of dollars would help. If you really want to use that bailout money and do some good in these tough economic times, how about 140 large to pay off my student loans? Is the poor guy okay? How did he accidentally shoot himself in his own leg? Why did he need a gun to go clubbing? 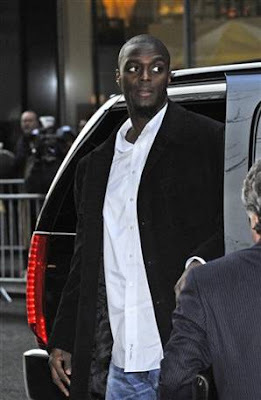 Why was he packing heat without a concealed weapons permit? How long will he be suspended? Will he go to jail?